You say party, I say tortilla. I have loved Spanish tortillas since I tried them on my first trip to Spain a million years ago and have been making them just about as long. Let us be clear. I am not talking about the bread-like Mexican tortillas that are used for wrapping burritos and quesadillas. 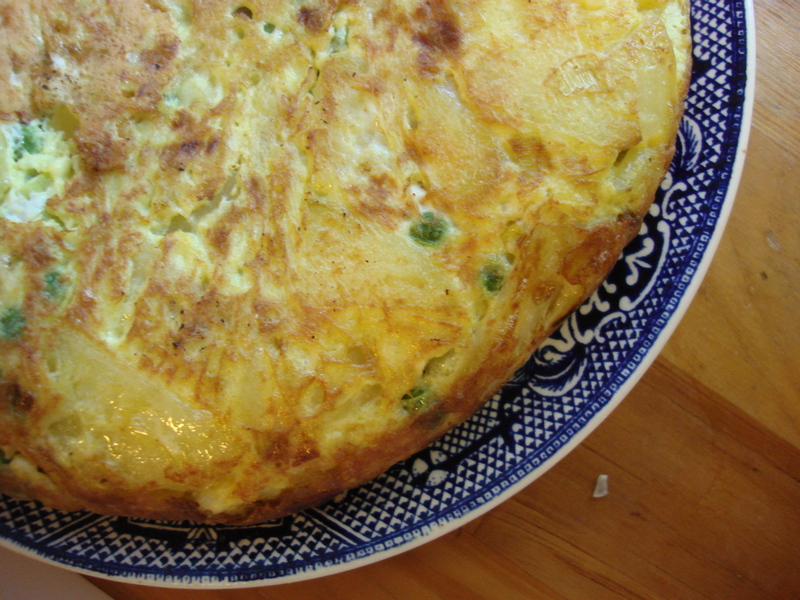 I am now talking about Spain, where tortilla means a stove top egg cake, a thick omelette, a frittata. Many are vegetarian (and many are not). All of them allow you to play with ingredients! 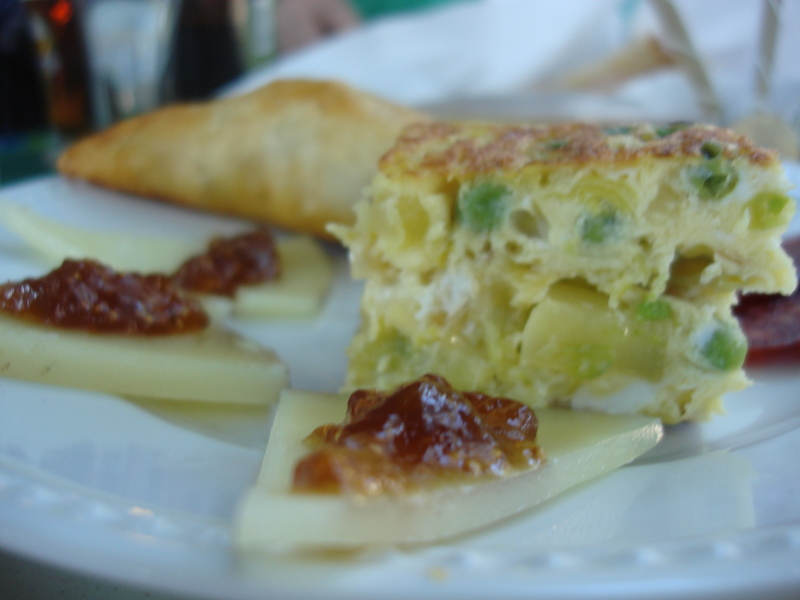 The classic tortilla, served in thick wedges at tapas bars the country over, is called tortilla española or tortilla de patatas and is a basic yet magical combination of onions, potatoes, and eggs that manages to be good warm or cold; to be filling, yet light; to be simple, yet satisfying for both palate and belly. 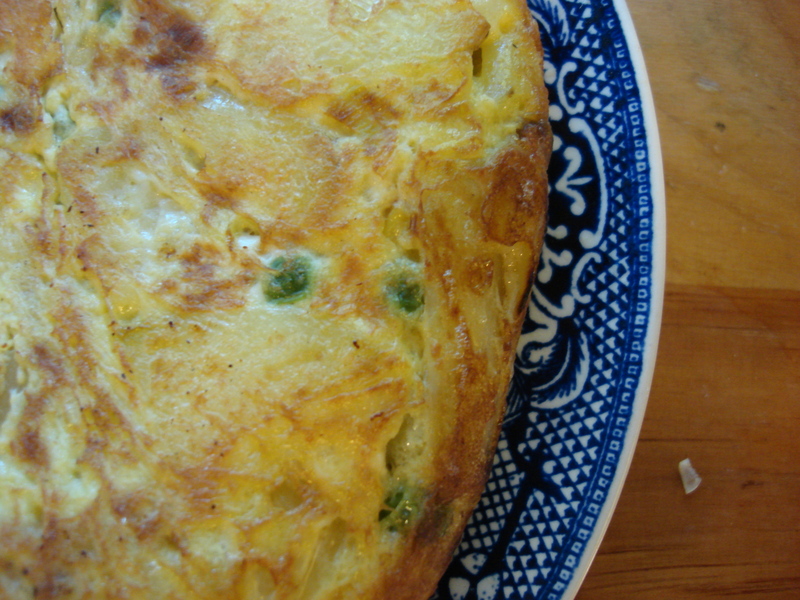 There are also endless regional variations, such as tortilla torcal – a hearty slab of egginess studded with spicy chorizo sausage, ham, peas, and (if you must) Lima beans (I mustn’t). 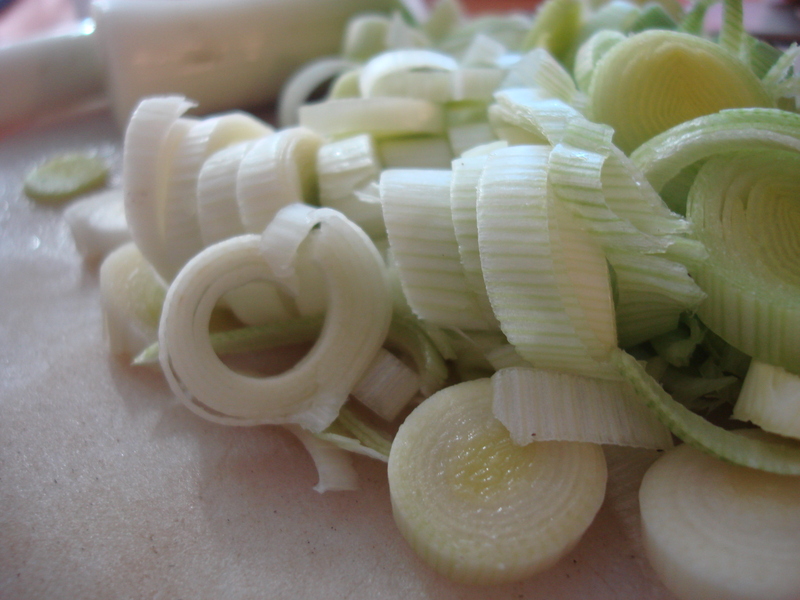 Cleaning leeks thoroughly can take a while….but the results are worth it. and by a desire to do something different from all the British/Irish Leek and Potato Soup-type things you see around. Heat oil until liquid and fragrant and layer leeks and potatoes in the oil. Lower heat to medium and cook vegetables until tender (if they start to brown, lower the heat more), turn occasionally. In a large bowl, gently beat eggs. Stir in salt. When vegetables are tender, drain into colander, reserving oil. Put drained vegetables in egg mixture, add peas, and stir to cover, adding 1/4-1/2 tsp salt. Allow to rest for five to ten minutes. Pour egg mixture into pan and allow to cook at medium high until a crust forms on the part of mixture that is in direct contact with the pan. Cover and lower heat to medium low, shaking occasionally. When mixture is relatively firm CAREFULLY lay plate face down on pan and turn tortilla onto pan (this is where liquid can come out; I do it over the sink). Slide tortilla back into pan, uncooked side down. Continue cooking until it slides easily in pan. You may flip a few more times to improve shape, then flip onto plate, allow to cool for at least ten minutes, slice pie-style and serve with salad or cut into squares for a buffet, party snacks or appetizers (stick with toothpicks for hors d’oeuvres). NOTE TO READERS: This is a reblog to help you out with party menus over the holidays….in addition to the leek tortilla in the title, there are links to three other gorgeous tortilla recipes! I love those also and haven’t thought about them since my last trip to Spain. Lovely photos. Thanks Tammy! It was fun to mix the seasonal into the traditional from far, far away! Thanks Elly! Hope you’ll get a chance to try it! I LOVE Spanish Tortillas! I remember the first time having one when I went to Spain and I fell in love 🙂 Thanks for sharing. Looks delicious! Maybe I should rename it Tortilla a la Ryan Giggs?